Dutch graphic artist and painter of German descent, the outstanding line engraver of his time. He was the leader of a group of Mannerist artists who worked in Haarlem, where he founded some kind of academy with Cornelis van Haarlem and Karel van Mander. 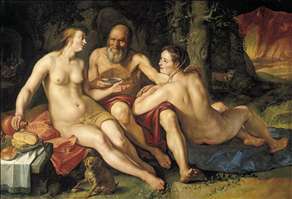 Goltzius was born in 1558 in Muhlbracht, present-day Bracht-am-Niederrhein. Called a fat, wild, and lively child by Van Mander, Goltzius fell into a fire when he was about a year old, after which he was never able to fully open his right hand, the one he would nevertheless use to draw, engrave, and paint. Recognising Hendrick s artistic interest and ability, his father, Jan Goltz II, removed his son from school at age eight and allowed him to study drawing and glass painting, his own profession. About 1575 Goltzius was apprenticed to learn the art of engraving from the exiled polemicist and engraver Dirck Volkertsz Coornhert. 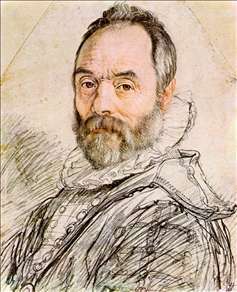 In 1577 Goltzius joined Coornhert in Haarlem, where Goltzius settled permanently. In 1579, Goltzius married Margaretha Jansdr, a widow, and became step-father to Jacob Matham who would follow in Goltzius s footsteps as a printmaker. After working for the Antwerp-based publisher Philips Galle for a few years, Goltzius in 1582 began to publish his own engravings. 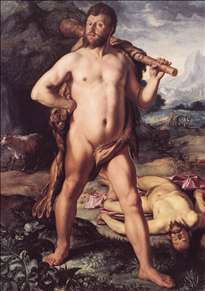 By 1585 Goltzius was working in the idealised international style now known as Mannerism. This flamboyant mode of representation had been introduced to Haarlem in 1583 when Van Mander settled there and brought with him drawings by the Flemish artist Bartholomeus Spranger, whom he had met and worked with in Italy and Vienna in the mid-1570s. Goltzius engraved a number of Spranger s compositions, and his own designs also began to derive inspiration from this aesthetic. 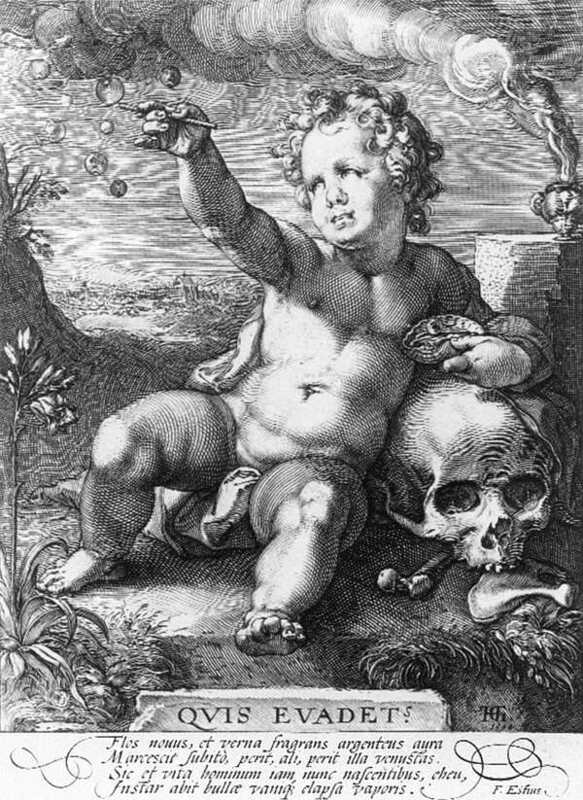 With their calculated extremes of anatomical excess and distortion, intentionally ambiguous definition of space, and an all-encompassing devotion to surface ornamentation, Goltzius s engravings from this period, 1585 to 1590, epitomise the conscious avoidance of naturalism and the deliberate over-refinement of this anti-classical approach. 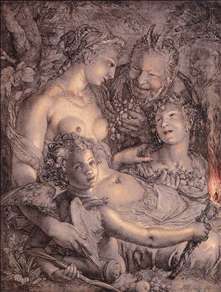 By decade s end a lessening of his Sprangerism is evident in Goltzius s engravings and drawings, a tendency that was reinforced by his journey to Italy. In January 1591, he arrived in Rome, where he sketched after Raphael, Michelangelo, and Polidoro da Caravaggio, and to an even greater degree from antiquities. 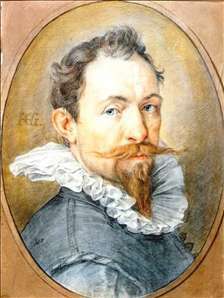 Goltzius s colourful portrait drawings made on his way to and from Italy are of great beauty and significance as well. He returned to Haarlem by the end of 1591. With the assistance of his many followers, Goltzius throughout the 1590s experienced much success as an engraver and publisher, and his activity with chiaroscuro woodcuts was of consequence as well. 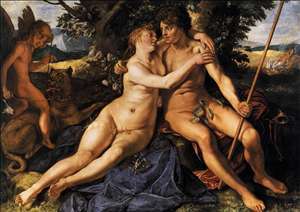 By 1600 he enjoyed a far-reaching reputation as Europe s pre-eminent graphic artist. Around the outset of the new century Goltzius created what are perhaps his most extraordinary works of art, his Pen-wercken on large parchments and prepared canvases. Goltzius s landscape studies of the environs of Haarlem drawn about this time demonstrate that he played a decisive role in the development of the seventeenth-century Dutch realist tradition. Also in or around 1600 the artist exchanged burin for brush and became a painter, a pursuit he followed until his death on New Year s Day 1617. 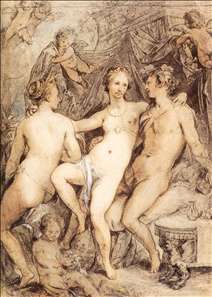 While vestiges of Goltzius s Mannerist past are to be seen in some of his paintings, in particular certain of his early endeavours in this domain, the influences of his Italian sojourn, his ongoing activity with drawing from live models, as well as the critical impetus derived in 1612 from contact with Rubens during his visit to Haarlem, resulted in his painted coppers, panels, and canvases assuming a more classicising idiom. See more details about "Hercules and Cacus"
See more details about "Portrait of Sculptor Giambologna"
See more details about "Lot and his Daughters"
See more details about "Quis evadet?" See more details about "Minerva"
See more details about "Jupiter and Antiope"
See more details about "Venus between Ceres and Bacchus"
See more details about "Without Ceres and Bacchus, Venus would Freeze"